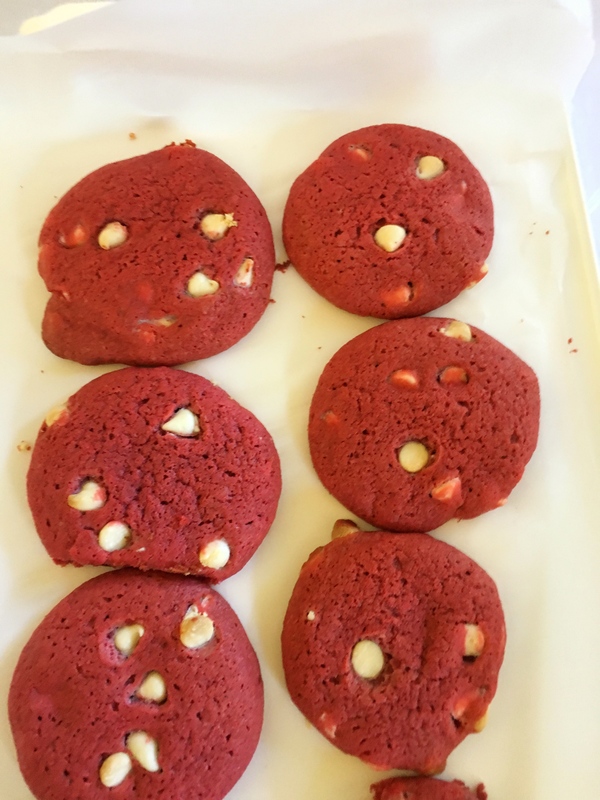 These delicious Red Velvet cookies are soft and sweet. 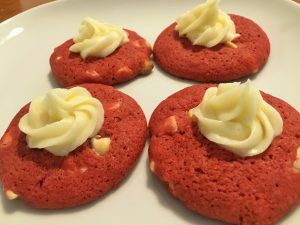 The recipe is easy to make and similar to making a red velvet cupcake. The cookie came out of the Red Velvet Cupcake craze around 2008ish. Growing up, I had never heard of a red velvet cookie. Now we have Red Velvet Oreos! I love the taste of red velvet cupcakes, my favorite red velvet cupcake is from Auntie Em’s bakery. After a lot of experimenting I figured out my own delicious red velvet cupcake recipe. With that challenge completed, I embarked on a new adventure: red velvet cookies. 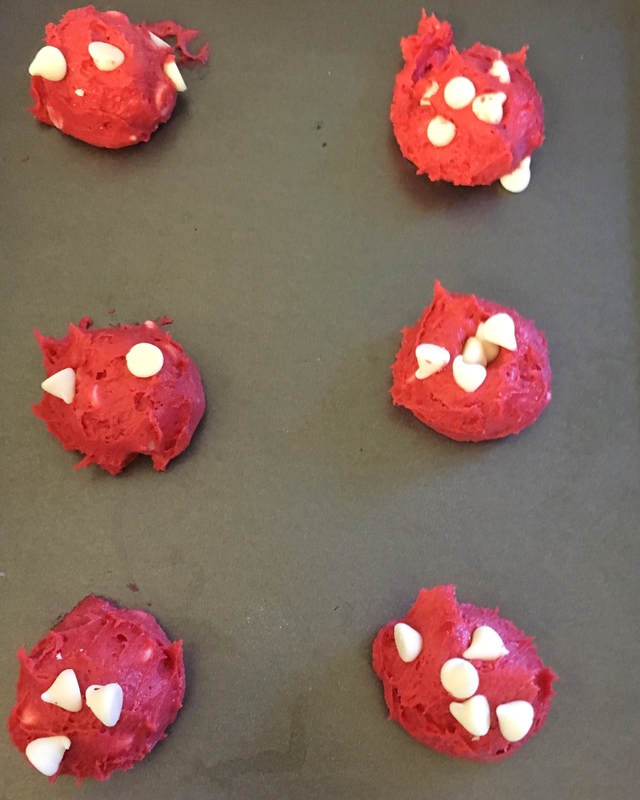 So, I tried a few red velvet cookie recipes that I found online but nothing came out quite right. Most of the recipes tasted too much like chocolate or didn’t have much flavor. Therefore, I was determined to figure out a good recipe. I did some experimenting and came up with my own recipe. 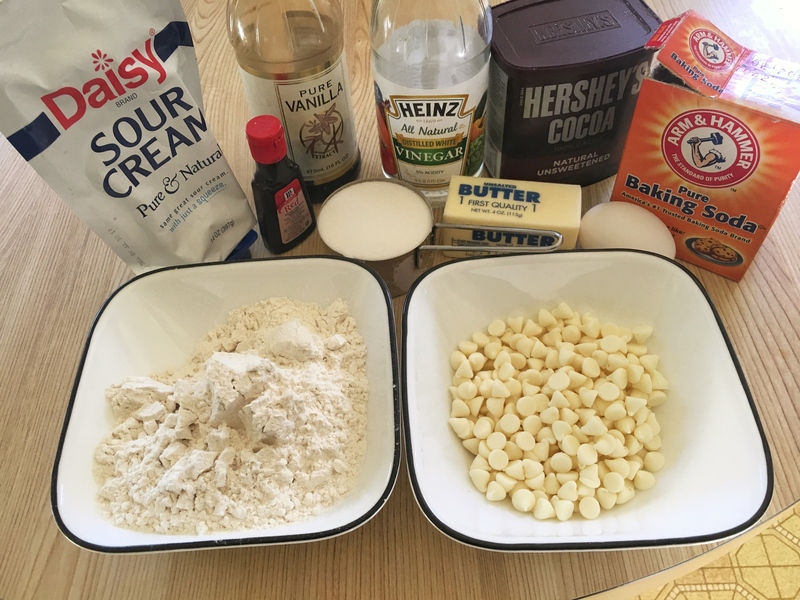 Taking all the ingredients in my cupcakes, with the exception of the milk, I decreased the amounts for my cupcakes and tried to make them into cookies. 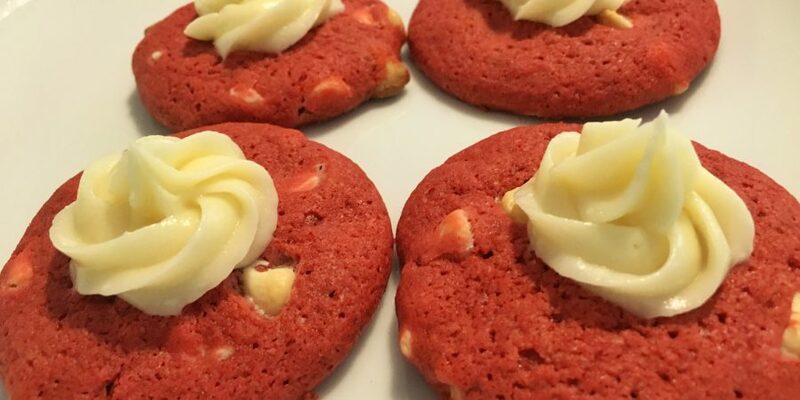 In my opinion, these red velvet cookies taste just like a red velvet cupcake. Everyone I’ve baked them for has loved them. They are very soft and sweet! The trick is to bake all the cookies immediately after you make the dough and then once they’ve cooled, let them sit in an air tight container for at least 2 hours before adding cream cheese icing to the top. The longer the cookies sit, the more moist and delicious they become. Most noteworthy, if you eat them immediately, they don’t taste as delicious. 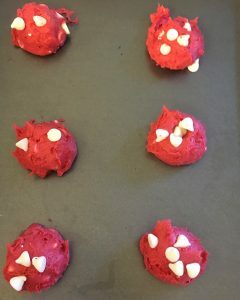 My kids love to make these cookies in different colors, so you can use any color dye. My daughter enjoys purple velvet cookies. This recipe makes 24 cookies. If you need more, just double the recipe. Mix butter and sugar in mixer on medium. Add sour cream, vanilla, and vinegar. Mix batter. Add dry ingredients together in a bowl. 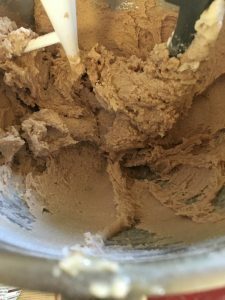 Mix flour, baking soda, and cocoa. Add dry ingredients to the wet ingredients in mixer. Mix on medium until well combined. Add food dye, about 10 drops. Then mix the batter until it’s completely red. Using a cookie scoop. Put cookies on sheet. Bake for 11-12 minutes. Let cool on pan for 2 minutes. Remove cookies from sheet and let cool. Repeat with remaining dough. After cooling the cookies for about 45 minutes, then seal them in a container for at least 2 hours. 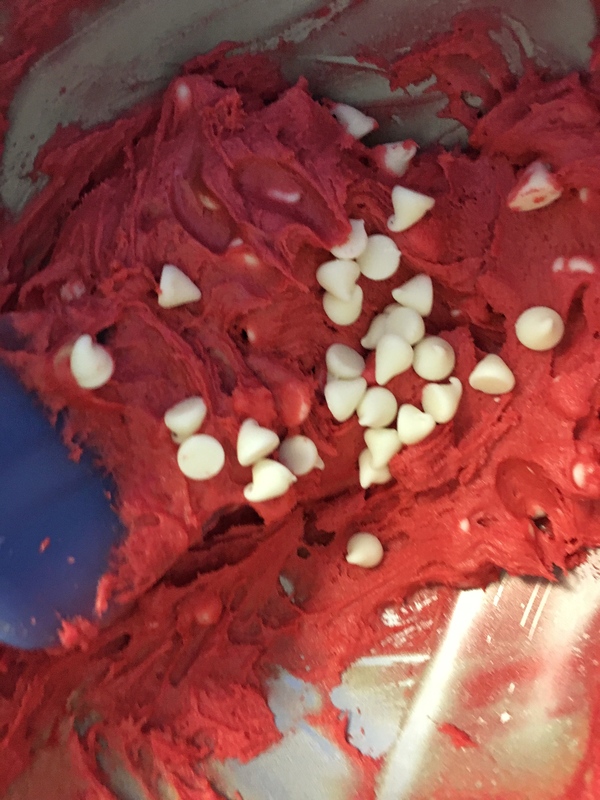 Make the cream cheese icing right before you’re ready to put it on the cookies. Thank you for sharing this recipe; Red Velvet is my favorite and my kids love it. 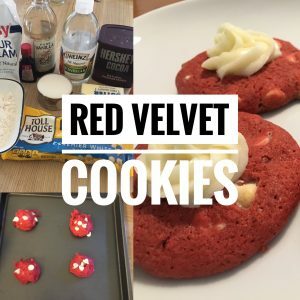 I have never made red velvet cookies before and this seems easy enough. I will try it and let you know how it turns out. This is a great activity to do with my little girls. Thanks for sharing. Great. Yes, let me know how they turn out!